After several years of experimenting with many genuses of plants I noticed that I have unconsciously been collecting the genus Salix (willow). Gardening on my 4.25 acres has been difficult at times because of the extreme changes of elevation and soil conditions. Some areas have no top soil, only hardpan, while other areas are boggy and wet throughout the year. In finding the right plants for the appropriate situation it seems that willows are a perfect solution for many areas of the garden. Salix is one of the early flowering pre-Ice Age plants. There is evidence that suggests that Salix began in the subtropics and eventually made its way to the Artic. One reason why the species has been so successful is that the fine seeds have tiny hairs that make it easy for them to be carried on the wind. It is a tough plant that has survived for 100 million years. Few plants can match its vigor and speed of growth and this is why I was drawn to the species. In Delaware County the growing season averages 90 to 120 days and we are lucky if our evergreens put out 6 inches of new growth a year. I have seen many willows grow more than a foot in one summer and some varieties as much as two to three feet a year. Salix, Latin for willow, comes from the Celtic word Sallis: Sal meaning “near” and lis “water.” Many willows can also withstand dry conditions. Willows range in form from weeping or erect trees, semi-weeping, contorted trees, arching shrubs, full shrubs, compact dwarf, and also trailing dwarf species. 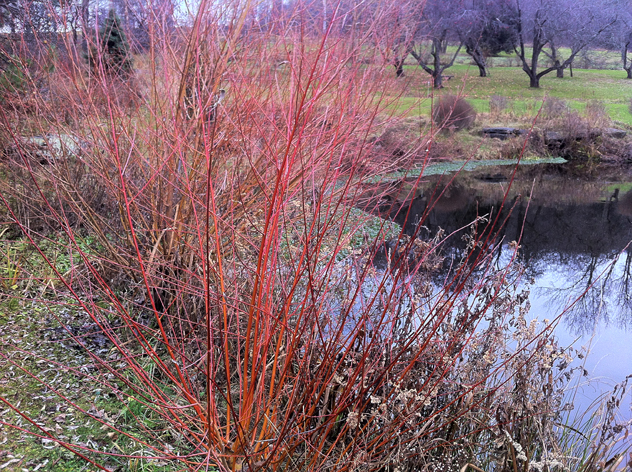 There are many ornamental willows with beautiful stem color. The other bonus of willows is the variety of catkins. If you choose the willow for its catkin then select the male of the species. In spring the male flower scales are released and the unopened antlers are revealed. Depending upon the species a wide range of color is available from dark purple, several shades of red, orange-yellow, and gradations of several colors. Salix has been one of the important materials used in the making of ancient crafts in America, Europe, Asia, and many other parts of the world for centuries. Coracles, a simple flat-bottomed boat, was constructed of willow and then covered in animal hide to make it watertight. These shallow round boats are thought to have been first used on the rivers in Wales and Ireland. Mainly used for fishing, the construction was both durable and flexible and the boat could easily be strapped across the fisherman’s back making it easy to travel between waterways. Julius Caesar while fighting in Spain in 49 B.C. ordered his troops to make wicker boats of the type he had seen in Briton. Here in America the Mandan Indians along the Missouri River area of North Dakota made Bull boats of willow and covered them in buffalo- or cowhides. Other uses of willow include baskets, hurdles, creels, eel traps, and crab and lobster pots. In Germany, Holland, France and Great Britain willow is used today to build living structures. Some of the inventive sculptures and forms include garden chairs, benches, arbors, tree houses, fences, wigwams and garden rooms. The willows are cut in the spring when they are pliable. As the form dries it hardens into a strong frame which serves as an armature for young willow saplings that are woven into the frame as the plants mature. Some of the living willow rooms are quite large and can hold up to 60 people. At the West Kortright Centre in East Meredith a small structure was built as a craft project for kids. The first willow I bought was Salix alba ‘Tristis,’ better known as golden weeping willow. The stately tree grows near ponds, streams and rivers. I planted a 1-inch caliber tree which stood 6 feet tall and within 3 to 4 years it was a 5-inch caliber tree and 15 feet tall. I could have sworn the tree grew during the winter months. One summer a gang of yellow-bellied sapsuckers attacked the tree. They drilled sap wells in regular patterned rows on the trunk and drank the sugary sap. Although the tree had some dieback it did survive the woodpecker’s jack hammering attack. This is clearly a tough tree. My next choice was one that I discovered while beginning to make my garden in upstate New York. Like many people new to gardening I was desperate to have the so-called “problem plants” that would quickly outgrow their home. I used to say, “Give me the problem.” At that point my garden looked more like the prairie than the cozy, slightly disheveled place it’s become. The willow that has outgrown its home is Salix integra ‘Hakuro Nishiki,’ the variegated Japanese willow. Last summer I cut it back three times, removing more than 2 feet off the top each time. The shrub is now about 10 feet tall by 12 feet wide. It’s like a friend that moves in and eats you out of house and home. Although the plant is no longer right for the initial site, it’s still a terrific plant. Each spring the fine coral red branches seem to intensify in color as the earth thaws. As the days grow warmer, the long leaves unfurl white with a pink tip. As summer approaches, the leaves become more mottled with specks of green, white and pale yellow. This fickle shrub changes costumes throughout the year. It is a great plant for lightening up a dark area of the garden and would work in a large border or planted in a wild area with some room to spread. In the early days of gardening in Delaware County, it frustrated me that I could not have the temperate plants I was familiar with farther south, and so I desperately began to focus on plants that came from Siberia. My thought was these plants would flourish in the Catskills. I bought Salix purpurea ‘Nana’ (arctic willow). The beautiful blue-green leaf willow stays quite small for a willow, reaching a height and width of 5 by 6 feet. It is hardy to zone 3 and has superfine leaves and moves beautifully in the wind. A gardening friend of mine, having seen this specimen in my garden, decided to make a hedge of the artic willow in front of her house. 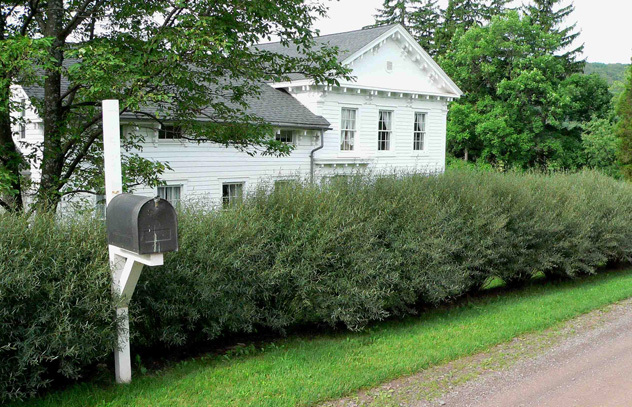 Her Greek Revival farmhouse sits close to the road and neighbors would drive by slowly peering into her house at all times of the day and night, driving her mad. My friend can now walk around freely in her house because this beautiful hedge has blocked the neighbors’ ability to snoop and it also blocks the dust that rises when cars pass by. Salix elaeagnos (rosemary willow), which is hardy to zone 4, caught my eye in Dirr’s Hardy Trees and Shrubs, the gardener’s bible. I always look for interesting color and texture for the gardens I design and this plant should be used much more in our gardens. It has long leaves, 3 to 4 inches, and only about 1/8 inch wide, which are similar in texture and color to rosemary. The shrub looks like a rosemary plant on steroids but with graceful arching branches. Its affect in the larger landscape is that it seems to blur the eyes. In the garden, texture is as important to overall composition as is color and this soft grey plant looks terrific against or near dark evergreen plants. It develops an oval rounded habit, reaching 6 to 10 feet both high and wide. 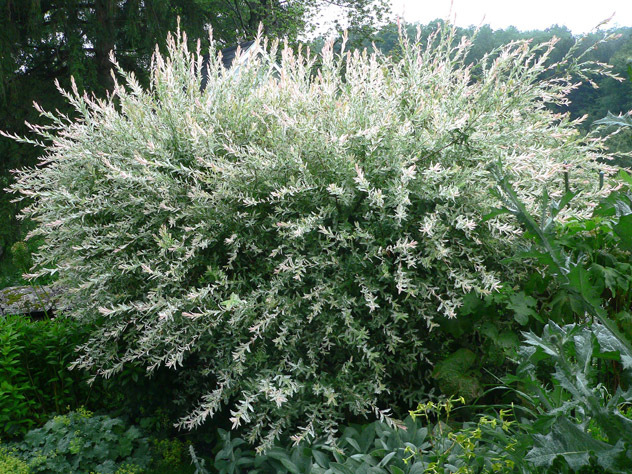 This shrub, which is on my list of top ten shrubs, is still a little hard to obtain but can be found in nurseries that pride themselves on having unusual plants. It’s worth your while to ask your local nursery for help in locating the plants you want. While visiting a large shrub nursery last fall I discovered a plant that I’ve wanted but had never seen: Salix alba ‘Britzensis.’ The fine, thin, pale yellow leaves drape over a coral red-orange bark and remind me of a Tibetan mural. 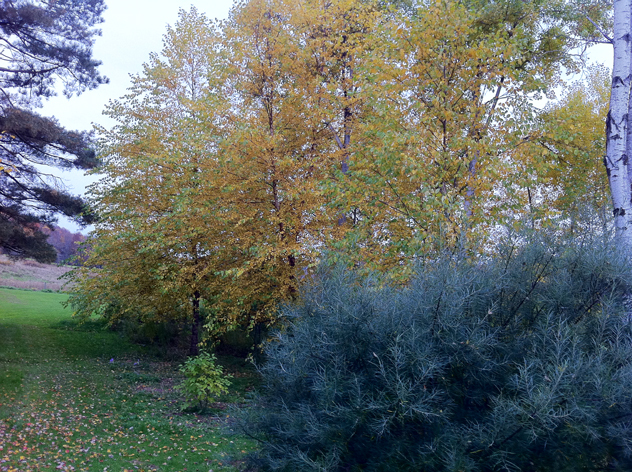 The plant is at its most beautiful in the fall when it exudes light. I got three of these shrubs and planted them for a client. I have finally secured this plant for my own garden and it will add a stroke of color to the dismal grey winter months. Another specimen worth considering for a large area is the Salix sachhalinensis ‘Sekka’ (Japanese fantail willow). I have yet to grow this plant but I have seen it growing near streams and ponds in Scotland. It grows 10 to 15 feet high and wide and is hardy in zone 4. It has flat twisted brown branches that are covered in silvery grey catkins in the spring. The curving branches are very beautiful and are often used in floral arrangements. In summer, this large shrub develops 4-to-6-inch long, 3/4-inch wide dark green leaves. The plant resembles bamboo and adds a tropical feel to our northern gardens. With the floods we have experienced in our area, Salix is a good choice for stabilizing river and stream banks. The invasive spreading root system binds the soil and is effective in holding river banks in place. Salix interior ‘Row’ is found on sandbars and other soil types from Alaska to the Great Plains. Local governments here in Delaware County have been spending a fortune on rebuilding washed out river banks. It would be smart to plant a few suckering willows as additional insurance. Here in the northeast our patience in the garden is constantly being tested. I remember talking to an elderly farm lady who told me the old wives’ tale about plant growth: “First year it sleeps. The second year it creeps and the third year it leaps.” I have often waited 5 to 6 years for plants to move. If, like me, you’re tired of waiting, I suggest planting one of the many willows for some instant gratification. Hi, I came across your article by chance , and was happy to read it . We just signed a contract for a piece of land in Delaware county , and I was wandering if I can get few advices about the potential of the land prior to purchasing . I am an amateur gardener , reading about your frustration in the first years of gardening in Delaware county reminded me my experiences gardening in NYC after immigrating from israel. I would really appreciate if you can make yourself available and we can spend an hour at the property I’m intending to buy . Thanks for the inquiry. I have sent you an email with my rates.